From the heart of Extremadura rises the majestic town of Trujillo, bringing together culture, history and world class music in the city’s very own annual International Music Festival. Every July the city of Trujillo transforms into an international platform for the finest classical musicians in the world. The enchanting patio of El Palacio de los Duques de San Carlos becomes the stage for three exceptional evenings of classical music in a unique and stunning venue situated at the heart of this historic town. For three sultry summer evenings the palace’s claustro is transformed into an intimate concert stage where you will be enveloped in the finest live classical music performances, all accompanied by candlelight and the most delicious wines and tapas that the region has to offer. The International Music Festival of the City of Trujillo is hosted by one of the UK’s most prestigious ensembles, the Soloists of London – eleven hand-picked string players from the world’s greatest professional orchestras; The London Philharmonic Orchestra, The Academy of St Martins-in-the-Fields and The English Chamber Orchestra. 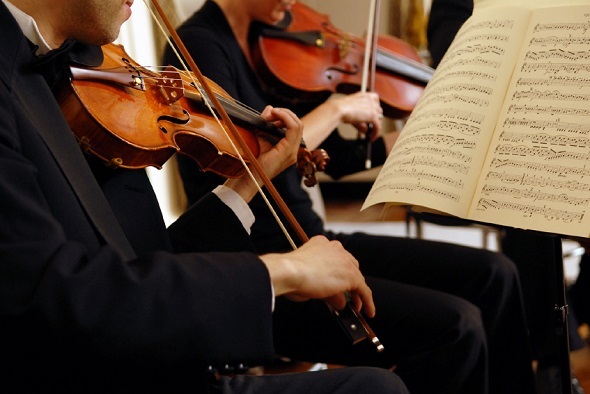 Passionate about Chamber Music, these flexible musicians have performed works from the sixteenth century to the present day, working together in perfect harmony, whilst standing to perform freely without the presence of a conductor. Between them they have collaborated with world-renowned artists as diverse as Madonna, Pavarotti, Sting, José Carreras, Diana Ross and Sir Paul McCartney and have given concerts in front of the late Pope John Paul II, the Queen Sofia of Spain and Queen Elizabeth II as well as recording Oscar-winning soundtracks such as ‘The Lord of the Rings’ and ‘Harry Potter’. Each year at the International Music Festival Trujillo, the Soloists of London will present a richly varied programme of music ranging from beautiful romantic classics and stunning virtuoso concertos to classical chamber favourites and great Italian opera. The Soloists of London ensemble will provide the very heart of this fantastic music while showcasing Spain’s leading artists, concert soloists and international singers – the perfect marriage of musical talents from the UK and Spain. Trujillo itself is an open, luminous, comfortable, enchanting and peaceful city that transmits a certain feeling of the well-being of the medieval Spanish hidalgo. Trujillo is located in the highest part of a magnificent granite rock mass scattered over with holm and evergreen oaks. Upon approaching Trujillo, the traveller feels as though he has encountered a medieval ship beached on a rocky hill – its towers and ruins trim themselves against the sky. It is a beautiful medieval city, an obligatory stopover for visitors who wish to discover the history of this vast Extremaduran landscape. With the combination of Trujillo’s historic Spanish charm, world class music from the finest classical artists and one of Spain’s most beautiful venues, this is truly the most magical and unforgettable experience of the summer.